What do you hate most about eating on planes? What do you hate most about eating on planes? Is it the soggy sandwiches? The murky liquid that masquerades as coffee? Or maybe just trying to meet the logistical challenge of eating from a crammed tray without knocking over your drink or flinging your cutlery onto the floor? In a survey in the US, the quality of food ranked surprisingly low among complaints about airline food. The YouGov survey of 1000 travelers found only seven percent buy a meal onboard when travelling on a non-catered airline, but poor-quality food was not the issue. Limited food options ranked much higher on the complaint scale, along with the cost of what was on offer. 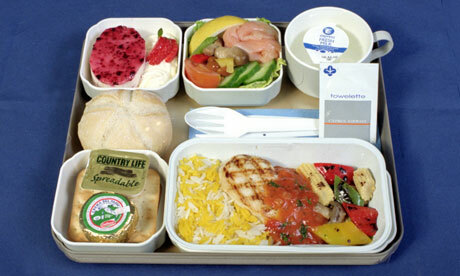 Smaller numbers complained that the portion sizes on planes were too small or that there was a lack of healthy options. Personally, I think the worst aspect of airline food, particularly on long international journeys, is the repetition. The same old salad with strange smoked meat in the corner, the same bread roll, cheese, crackers and chocolate mousse surrounding … oh joy… chicken and rice again. If it’s not chicken and rice, it’s beef and rice. The food up the front is much more interesting, but less than 20 per cent of passengers are eating that – and even business class passengers get chicken and rice. Having had that rant, I do think we can be rather fussy when it comes to airline food, especially when we’re flying to the other side of the world for under $1500 return. We love to complain about what we’re served and post dodgy pictures on social media but the logistics of serving hot food to hundreds of passengers, sometimes many hours after take-off, are considerable. And we’ve all seen passengers imbibe their plane fare in ‘free’ alcohol, just because they can. The editor of airline review website Airreview.com, Jules Lorkin, says catering is a real headache for airlines, as it is expensive to produce, adds weight on aircraft and generates the most complaints. “If you ask passengers who don’t fly regularly how their flight was, the thing that sticks most in minds is often the inflight food,” he says. Adding to the challenges of serving food at altitude are the complications of serving dozens of different types of meal on one flight, to cover religious beliefs, medical conditions, health fads and general fussiness. Singapore Airlines, for example, now offers more than 30 special meal options; a list that makes fascinating reading. There are six different types of vegetarian meal – who knew vegies were so complicated? – along with meals that are low fat, low fibre, low lactose, low salt or low calorie. If you’re anti-carbohydrates, they’ve got you covered. And if you get an ulcer from trying to work out what sort of meal you need, they can handle that too. Cathay Pacific revealed recently it is now serving more than 1.7 million special meals a year. Demand for healthier meals is the biggest factor, with low calorie, low cholesterol and low salt meals in hot demand. Gluten intolerance is also on the rise, with gluten-free meal requests jumping more than 100 per cent in four years. It’s certainly gotten more complicated, but has there been any improvement in the fare? In the US study, which only related to short flights, 27 per cent thought airline food had decreased in quality over the past couple of years, while 20 per cent believed it was unchanged and a positive-thinking seven per cent said it had improved. Jules Lorkin believes the most noticeable change is that quantity has been reduced in a bid for better quality. Airlines that used to serve up full meal trays are now dishing up smaller portions, perhaps with the entrée and dessert cut back but a better hot dish. Lorkin believes airlines have split into two camps: those that use their food as a sales tactic and those that see it as a necessary evil and constantly chip away at the costs. “Those carriers which use inflight meals for sales certainly ramp up the celebrity chef element and promise that dining at 30,000 feet will ‘never look so good’,” he says. Best of a bad lot? It’s hard not to eat out of boredom when you’re strapped into a seat, so nutritionist Zoe Bingley-Pullin recommends ordering a low calorie meal. Eating high-fibre foods is the most important factor in avoiding digestive ails caused by sitting still, along with staying well hydrated, she says. Bingley-Pullin, of Nutritional Edge in Sydney, tells her clients to drink two litres of water before getting on the plane and to keep drinking (water, that is) throughout the flight. You are currently browsing the archives for the Lufthansa category.